I am a certified ‘Quote-aholic.’ I fell in love with quotations as a sixth grader when my teacher, Mrs. Williams had us memorize a different quote each week. The words intrigued me and I began absorbing them. The love for quotes has never left me. When the category on Jeopardy has anything to do with quotations, this girl is on fire! Quotes Rock! 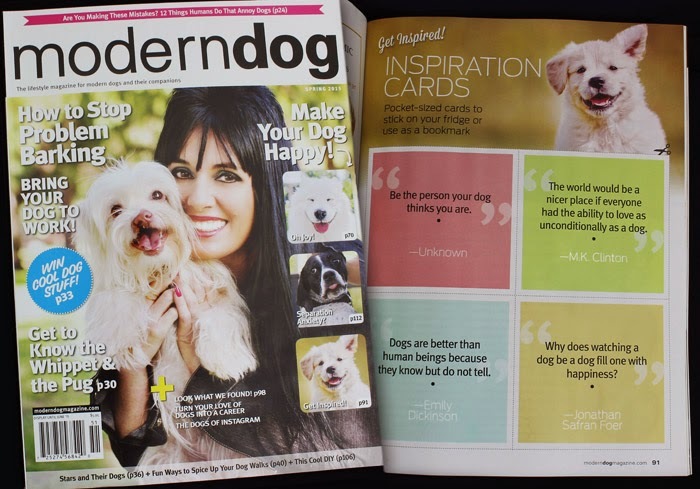 You can imagine my excitement when one of my blogging friends, Chelsea Price from Second Chances sent me a 'tweet' to say that she had seen MY QUOTE in the spring edition of Modern Dog Magazine! I went to my local bookstore and found the newest edition and there on the cover is a box that says “Get Inspired” page 91. I eagerly turned to the page and LOOK! It is a quote from my second book TheReturns 2 ~ Showstoppers. I am extremely honored and since my birthday is the first day of spring, it is the best present that I could receive! 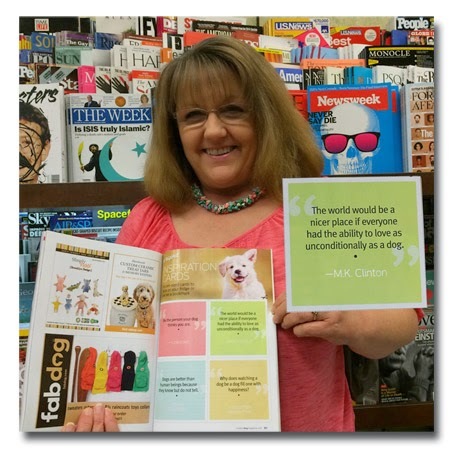 We are joining with BlogPaws for their Wordless Wednesday blog hop. Join in the fun below. We are so excited for you!! Congratulations!! That is AWESOME! OMD pawsome we are so pleased for you. Have a wonderful Wednesday. OMD! How pawsome is that? Congratulations! This is amazing! Henrietta and I are dancing around the room! That is a Quote Worthy of QUOTING !! Bravo... Well Done!!! How cool!!! Love that quote, congrats!!!! That's awesome. I love quotes too and I'll be keeping yours in my little stash of inspirational quotes that I like to draw upon if I'm ever feeling down. Thanks and congrats! WOW!!!!! Congrats Melissa!!!!! That is just fantastic!!!!! Great quote - and so true! How cool to get published like that. Congrats! that is a great quote! Oh My Dog, you're the brainchild of a famous and amazing doggy quote!!!! Very cool! Congrats on making it into the magazine. That has to be a really proud moment. Congratulations on having your quote published. Your words are beautiful and so true. Still planning on visiting? The weather is getting nice!! Congratulations - what a huge compliment that a magazine like Modern Dog quoted you. They didn't just quote you, they put your quote on an inspiration card for millions of people to cut out and be inspired by, now that's really something! Your words are beautiful & inspirational! That is so cool - You should be excited - I hope you did your little happy dance when you found out. This is certainly happy dance worthy. I am going to bring my copy to BP just so I can get a signed copy. Happy early Birthday too! Congratulations! What a great honor for a quote junkie like yourself. How exciting! That is so cool....congratulations!! I saw this on FB first and how very exciting for you, that is awesome and I bet you bought up the whole mag rack. I love quotes too!! ( I don't think your smile could be any bigger). Happy Birthday early too! OMD OMD OMD OMD! Look at you! I'm talking to a celebrity! I hope you still give ear rubs....Never mind that is silly of course you do! Wow, that is amazing! I've been a subscriber to Modern Dog for many years and have the new issue at home waiting to open up. Now I'm even more exited to get to it!! Congratulations! !